Students who live on campus or near campus may get around Durham without an automobile. The free Bull City Connector takes riders between campus and downtown Durham. The bus route connects with Durham area buses and Triangle Transit, providing connection to the region, including Chapel Hill and Raleigh. 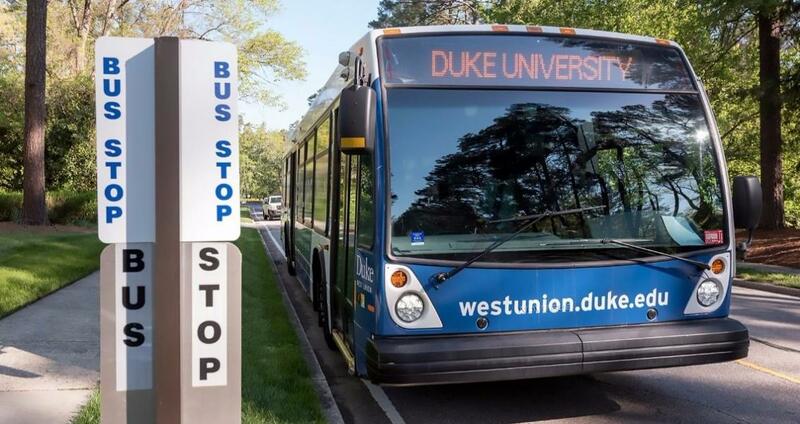 On campus, free Duke Transit buses travel between East Campus, West Campus and the UNC-Chapel Hill campus. Bicycling is an ideal way to get around Duke, Durham and the region. Duke makes it easy and convenient to park your bike close to your building. Duke offers a convenient bicycle registration program for students. Enterprise CarShare vehicles are available at Duke. Please visit the dedicated Enterprise CarShare webpage for details. To park on Duke's campus, please acquire a permit. Many options are available in various locations and price ranges. Short-term metered parking is available at multiple locations on campus. On-demand van services are available after transit operating hours to all students, faculty and staff. Duke Vans also provides safe rides to locations without bus service within the van service boundaries during times when buses are not running. Duke University is located about 15 miles from RDU international airport, which offers direct and connecting service to airports throughout the United States and internationally. During Fall Break, Spring Break, and Thanksgiving free airport shuttle service from campus to RDU is made available to Duke students. Durham is served by Amtrak intercity passenger rail – with daily trains to Charlotte and to New York City, via Washington, D.C. Find out more. Greyhound provides intercity bus service.